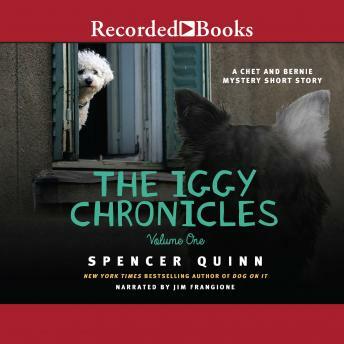 Iggy is a dog who doesn’t get out much, so it’s big news when elderly Mr. Parsons knocks on Bernie’s door to say that Iggy has vanished. In the search for Iggy, Chet and Bernie find Mrs. Parsons unconscious on her bedroom floor, in need of urgent medical care. But it’s only when they arrive at the hospital that things get really interesting. With a jewel thief making short work of hospital patients’ valuables, it seems that Iggy is not alone in disappearing right out from under somebody’s nose. Suspects are plentiful and witnesses are few. But when little Iggy reappears, tail wagging, it turns out he holds the key to solving the entire affair. In addition to a clever caper and the return of much beloved characters, this gem of a short story is a testament to the enduring power of friendship in all its forms: neighbor to neighbor, man to dog, dog to dog. Here is a treat you’ll devour in one sitting—rather like Chet with a juicy steak that’s been momentarily left unattended!